Can you please help me do our itinerary, were leaving Ph about 5am and 7:40am is our ETA we'll be staying at USA Hostel. We'd like to visit Disneyland and nearby tourist spots on the 1st day, 1/2 day in Macau back again in HK for another tourist spots for the 2nd day. Ocean park and Snoopy house and other tourist spots again for the 3rd day. PLease i need you help and hoping to also have directions and cost of MTR. Here's to read getting there instruction from HK airport to Silka Far East Hotel (formerly Dorsett Far East Hotel) by bus. Yes, it is also ideal to go straight to Disneyland from HK airport to save time and money also considering that hotel check in time usually after 2:00pm. You can leave your luggage at Disneyland. There are luggage lockers for rent (follow link to read details) available at HK Disneyland. Hope you can help us make our first visit to HK enjoyable. We are taking public bus from HKIA to Silka Far East Hotel, (pls give us directions), leave our luggage, then go to Disneyland (pls give us directions from hotel to Disneyland). Or do you suggest that we go straight to Disneyland as our flight arrives in HKIA at 10am? Will they allow backpacks. We also have one suitcase, do they have a place where we can leave it if they will not allow it inside Disney? These are other places we are thinking of visiting: Ocean Park, Victoria's Peak, Night market. We would appreciate other suggestions on places to visit and directions on how to get there. We are also interested in cheap places where we can shop. Cheap places to eat around the areas will also help as we are a big family. First, please be informed that Dorsett Far East Hotel has been already renamed as Silka Far East Hotel a 3-star hotel located at 135-143 Castle Peak Road, Tsuen Wan, Hong Kong. It is about 5 minutes walk to and from Tsuen Wan MTR station. Here you can see the Silka Far East hotel location map. Here's how to get to Wong Tai Sin Temple from Silka Far East hotel. Wong Tai Sin Temple which is located in the northern side of Lion Rock in the north of Kowloon and a short walk from Wong Tai Sin MTR station Exit B in Kwun Tong Line trains. Get into the Tsuen Wan MTR station --> take the Tsuen Line train and get off at Prince Edward station --> interchange trains to the Kwun Tong Line and get off at Wong Tai Sin station (28 mins @ HK$8.4). Getting to Hong Kong Macau Ferry Terminal from Wong Tai Sin. Get back into the Wong Tai Sin MTR station --> take the Kwun Tong Line train and get off at Mong Kok station --> interchange to the Tsuen Wan Line and get off at Central station --> interchange trains to the Island Line and get off at Sheung Wan station and take Exit D (27 mis @ HK$11.8). Follow directional signs to the Ferry terminal which is located just right above the MTR station in Shuntak Centre. From Macau to Jade Market (follow this link to see map and getting there from Yau Ma Tei MTR station). Once you arrive back to the Hong Kong Macau Ferry, just get into the Sheung Wan MTR station --> take the train and get off at Central station --> interchange trains to the Tsuen Wan Line and get off at Yau Ma Tei station and take Exit C (14 mins @ HK$9.9). Getting to Avenue of Stars from Jade Market. Get back into the Yau Ma Tei MTR station --> take the Tsuen Wan Line train and get off at Tsim Sha Tsui station and take Exit F (5 mins @ HK$3.8). Take about 8 mins walk to the TST promenade where you can visit the Avenue of Stars and the vantage point to watch the Symphony of Lights nightly show at 8:00pm. Getting back to Silka Far East hotel from Avenue of Stars. Get back into the Tsim Sha Tsui MTR station and take the Tsuen Wan Line train all the way to Tsuen Wan station (26 mins @ HK$8.4). * Getting to Disneyland from Silka Far East Hotel. Hope this help and have a safe trip to HK! Hi, I've read so much of this website and i know you helped people get directions and locations in different places in HK. Can you also please help me get to this places. Jade market to Avenue of stars and Symphony of Lights. From Symphony of Lights to Dorsett Far East Hotel. Thank you very much!!! Youve been a great help. Getting to Wong Tai Sin from Ngong Ping: Get into the Tung Chung MTR station going to Lai King Station --> Interchange train to Tsuen Wan Line going to Prince Edward Station--> Interchange train to Kwun Tong line going to Wong Tai Sin station -->get off at Wong Tai Sin station. (40 minutes, HK$14.1) Take exit B. Then, take a short walk and follow directional signs to the Wong Tai Sin Temple. 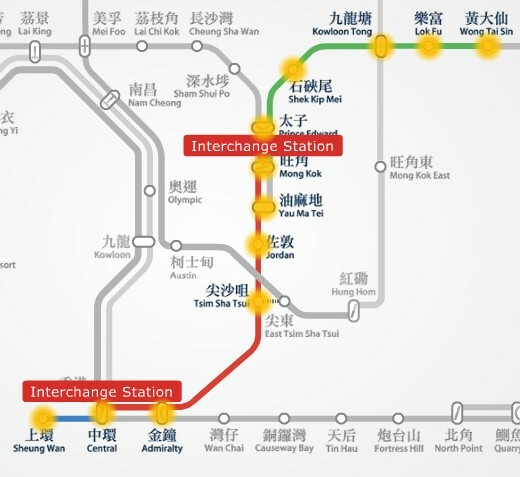 Getting to Sky100 from Wong Tai Sin: Get into the Wong Tai Sin station going to Prince Edward Station --> Interchange train to Tsuen Wan Line going to Lai King station --> Interchange train to Tung Chung Line going to Kowloon station(32 minutes, HK$6.9) then take exit D2. Then take a short walk to the ICC building. Here's a travel instruction in getting to Disneyland from Hong Kong airport. From Disneyland to Jumbo Kingdom: Take the Disneyland Resort Line and interchange trains to Sunny Bay Station going to Hong Kong Station (31 minutes, HK$27.7). Here's to read transportation details in getting to Jumbo Kingdom from Hong Kong MTR station. From Jumbo Kingdom, get back to Central and take MTR trains. Take the Tsuen Wan Line going to Tsuen Wan and get off at the last station. Take exit B1 and walk 6 minutes to your hotel. From your hotel to Ocean Park: Go to Tsuen Wan MTR Station and ride the train going to Admiralty Station. Take Exit B, (30 minute, HK$11.8). Here's how to get to Ocean Park from Admiralty station. From Ocean Park to Victoria Peak. Take trains from Admiralty MTR station going to Central Station. From Central station, make your way to exit J2 and walk up to the ground level to get to Peak Tram Terminus. Turn right through Chater Garden, cross Queen's Road Central, and make your way up to Garden Road. You will pass the Bank of China Tower and Citibank Plaza on your left and St John's Cathedral on your right. Getting to Avenue of Stars from the Peak. Board the Peak Tram shuttle bus No.15C going to Central Bus terminus. Walk going to Central Star Ferry Pier. Board the Star Ferry going to Tsim Sha Tsui Star Ferry Terminal (6-8 minutes, HK$2.50). Thank you so much for the suggestion, the Hotel is Dorset Far East. Can you please help me how to get to the places you suggested. Please specify which hotel are you referring to. If I may add, Macau, Disneyland, and Ocean Park, require a full day event. Ngong Ping requires at least a half day. Please help me get to this places. From Airport-Ngong Ping 360-Disneyland-Sky100-Dorset Hotel. Dorset Hotel-wong tai sin temple-Skypier going Macau. Macau-Avenue of Stars-Symphony of lights then going back to Dorsett Hotel. The peak- madame Tussaud- Ocean park- Jumbo Kingdom-Dorsett Hotel. Day1: Spend the whole day at Disneyland. Don't miss the "Disney in the Stars" Fireworks at 8pm. Day2: Spend the whole day at Macau. A day is enough to visit the tourist attractions there. Getting to Ocean Park from USA Hostel.